On July 11, 1911, the city of Bridgeport was in the midst of a long heat wave. Temperatures hovered around 80 degrees even in the early morning, long before the overnight darkness gave way to sunshine and still greater heat. Though a bustling industrial city, Bridgeport was undoubtedly fairly quiet at 3:30 that Tuesday morning. 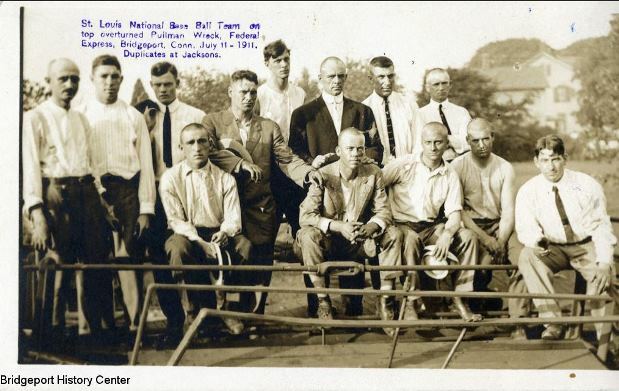 That quiet was soon shattered, however, when a passenger train on the northeast run from Washington, DC, to Boston, with nine cars and 150 passengers aboard, derailed on the section of track where Fairfield and Railroad Avenues met. The train, operated jointly by the Pennsylvania Railroad and the New York, New Haven and Hartford Railroad (or New Haven Railroad, as it became known), was more than an hour behind schedule and the crew attempted to make up time as they headed through Bridgeport. The tracks at that juncture reached an elevation of approximately 20 feet—as they do today—and the locomotive hurtled down an embankment to the street below, followed by most of the passenger cars. Within seconds, the area around Fairfield Avenue was a disaster, with twisted and crushed metal strewn about and flames shooting from several parts of the wreck. A number of passengers died instantly, some of whom, presumably sound asleep at that hour, never knew what happened. Many others received serious injuries (including several who later died) and their screams and cries filled the hot night air. In all, 14 passengers and crew members perished in the accident. The last two of the train’s nine cars were Pullman cars with sleeping quarters and they were the only cars that remained on the tracks. In this instance, all of the passengers on the Pullmans were members of the St. Louis Cardinals baseball team. The Cardinals played in Philadelphia on Monday afternoon and were en route to Boston for a Tuesday afternoon doubleheader against the Boston Braves. According to newspaper reports, as well as subsequent historical accounts, members of the Cardinals team played a crucial role as first responders. Roger Bresnahan, the team’s catcher and manager who earned enshrinement in the Baseball Hall of Fame in 1945, took charge and ordered the 22 members of the team into action. One report published in a Hartford newspaper the following day credited the Cardinals with saving many lives for their efforts in the crucial time before ambulance crews arrived. In addition, the number of people seriously injured might have been far higher than 47 if not for the actions of the Cardinals. It proved extremely fortunate for the St. Louis players that railroad workers in New York moved the Pullman cars to the rear of the train from their location immediately behind the locomotive on the first part of the trip (from Washington to New York). Accusations, charges, and at least one lawsuit over who bore responsibility followed in the weeks after the wreck. Criticism of engineer Arthur Curtis came from multiple sources, including from New Haven Railroad officials, when investigators determined the train entered the 15-mile-per-hour zone in Bridgeport traveling approximately 60 miles per hour. The company also sustained a great deal of criticism for what was, by some accounts, a poor safety record involving many serious accidents due to faulty equipment. 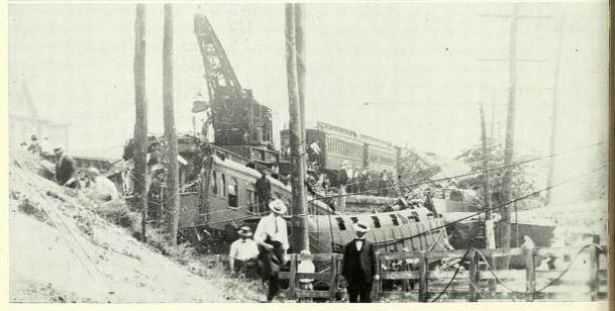 Investigations by the Connecticut Railroad Commission and the Interstate Commerce Commission eventually supported the company’s blaming of Curtis, who died instantly in the wreck. In ensuing decades, there were several other crashes close to where the 1911 wreck occurred. In 1955, an engineer died and 58 people suffered injuries in an accident on the portion of track in Bridgeport approximately a mile away from where The Ballpark at Harbor Yard now stands. And on May 17, 2013, a Metro-North passenger train derailed just across the Bridgeport/Fairfield line (several hundred yards from the site of the 1911 wreck) and crashed into another Metro-North train traveling in the opposite direction. There were no fatalities but a number of people suffered serious injuries. Bridgeport native Andy Piascik is an award-winning author who has written form many publications and websites over the last four decades. He is also the author of two books. Black Rock Civic and Business Men’s Club, and Ivan Justinius. History of Black Rock, 1644-1955. Bridgeport, CT: Antoniak Printing Service, 1955. Link. Grimaldi, Lennie. Only in Bridgeport: An Illustrated History of the Park City. Northridge, CA: Windsor Publications, 1986. Amore, Dom. “Heroes Off The Field: In 1911, St. Louis Cardinals Became First Responders in Bridgeport Train Wreck.” Hartford Courant. July 9, 2011. “Interstate Commerce Commission to Investigate Wreck of Federal Express, Unreported to Commission.” The Bridgeport Evening Farmer. July 13, 1911, Vol. 47-No. 164 edition, sec. Front Page. Library of Congress, Chronicling America: Historic American Newspapers. Link. “Man’s Body Taken From Debris of Federal Express; Other Bodies May Be Found.” The Bridgeport Evening Farmer. July 12, 1911, Vol. 47-No. 163 edition, sec. Front Page. Library of Congress, Chronicling America: Historic American Newspapers. Link.